Subway sponsors our Friday Fresh Take where we provide a recap of some of the state's most notable games and performances from Friday night's action. Here’s a look at several of the results that caught our attention from Thursday and Friday night of Week 9. The regular season is complete and it’s time for playoff football! Brackets are available under the PLAYOFFS heading at the top of Kpreps.com. The postseason is underway in Class 6A and 5A in which all schools are seeded into the bracket based on win/loss record and their season-long scoring margin. The method for seeding teams is strictly objective, and can result in some teams being under- or over-seeded without consideration for their strength-of-schedule (SOS). After one round, or Week 9, there were four “seed-upsets” in Class 6A and five more in 5A. Olathe Northwest defeated Shawnee Mission South for a second consecutive week. The Ravens built a 14-0 halftime lead on Friday and eventually led 34-0 in the third quarter before the Raiders got on the board. These same two reams met last week to close out the regular season with Olathe Northwest prevailing, 44-21. Tyler Cavil rushed for four touchdowns as Olathe South eliminated Shawnee Mission Northwest, 30-21. The Falcons built a 17-7 halftime lead on the strength of Cavil and an Adam Young field goal. The lead expanded to 24-7 in the third quarter on Cavil’s third score. The Falcons will travel to Blue Valley next week. Junction City grinded out a 28-21 win at Wichita West to advance in Class 6A. Baylor Wilkey’s short touchdown run with 2:16 remaining provided the winning points in a wild fourth quarter. Wichita West entered the fourth quarter holding a 14-7 lead, but Junction City tied the game after returning blocked Pioneer field goal 89 yards for a touchdown. The Pioneers would respond with a crazy touchdown run in which the ball was fumbled twice but eventually recovered by West in the end zone for a 21-14 lead. Junction City scored less than a minute later on a 60-yard touchdown sprint by Rooster Adams, but the PAT was muffed leaving the Blue Jays down 21-20 until Wilkey’s final score. For the second time in three weeks, the Campus Colts went into Hutchinson and defeated the Salthawks. On Friday, Campus built a 20-0 first quarter lead behind two Federico Harvey touchdown passes to his brother Cameron and a Sam Wise run. Hutchinson scored on a Tayezhan Crough run to pull within 20-7, but Harvey scored again late in the second quarter for a 27-7 halftime lead. Hutch controlled the second half getting touchdowns from Crough and Brody Smith, but were unable to climb all the way back. Campus defeated Hutchinson 35-7 in the meeting two weeks ago. 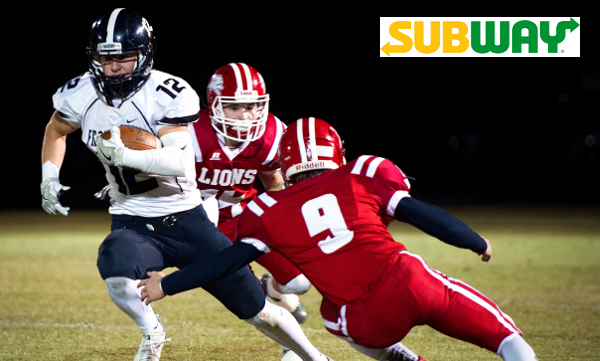 Two-time defending 5A champion Mill Valley advanced to the next round with a 31-7 victory over Topeka Seaman. The Jaguars overcame several penalties and three turnovers to hold a slim 10-7 lead at halftime. Mill Valley then added three second-half touchdowns to advance over the higher-seeded Vikings. The Jaguars will be at KC Schlagle next week. KC Turner is on to the Round of 32 for the first time since 2009 with a 41-7 win over KC Sumner Academy on Friday night. The Golden Bears controlled the game early in jumping out to a 28-0 halftime lead. Turner will travel to Hutchinson Field in Pittsburg to take on the Purple Dragons next week. Andover won at Valley Center for a second consecutive week, although this time it was much closer. After trailing 20-14 at halftime, Valley Center took a 21-20 lead on a Wyatt Lange touchdown pass to Dalton Cross in the third quarter. The Hornets then score on a Caleb Rains touchdown to lead 27-20 in the fourth. Andover came back with a short touchdown run by freshman quarterback Eli Fahnstock, but the PAT failed leaving the Trojans chasing a point at 27-26. David Kemp booted a 23-yard field goal with 2:24 remaining, his third of the game, to lift the Trojans to a 29-27 win. Andover defeated Valley Center 48-13 last week. Salina South, the 13-seed, went on the road to Liberal and came away with a 24-14 victory over the Redskins. Tanner Parret rushed for three touchdowns as the Cougars overcame a 14-6 hafltime deficit to pull off the upset. Salina Central improves to 3-6 on the season, while Liberal finished 6-3. Eisenhower goes on the road and beat 5-seed Great Bend, 35-28. The game was tied in the fourth quarter when Great Bend’s Dalton Miller busted a 52-yard touchdown run to put the Panthers up 28-21. Eisenhower would respond to tie the game and eventually score the game-winning points on a Justice Moore 3-yard run with 2:06 remaining. Great Bend would drive the length of the field to inside the Eisenhower 15-yard line, but could not score on a fourth-down play. Tonganoxie claimed a district title, Kaw Valley League title, and an unbeaten regular season with a 10-3 victory over rival Basehor-Linwood in the Kpreps Fan Game of the Week. The Chieftains and Bobcats were tied 3-3 at halftime of a defensive struggle. Finally, Dalton Bock broke a 55-yard touchdown run with 7 minutes remaining in the game to give the Tonganoxie a 10-3 lead. The Chieftain defense then came up big in stopping a Bobcat fourth-down scramble deep in Tonganoxie territory to secure the win. Bock finished with 118 yards rushing and the deciding touchdown. The Chieftain defense was the story, however, in holding Basehor-Linwood to 89 yards of total offense. Tonganoxie rushed for 219 yards in the game and Mason Beach passed for 86 more yards. The Wellington Crusaders are back in the playoffs for the first time since 2010 with a 28-14 victory over Ulysses. Michael Ledbetter threw a pair of fourth-quarter touchdown passes to help the Crusaders turn a 14-7 lead into a 28-7 lead. Ledbetter passed for 235 yards and three scores on the night. Zander Vargas caught a pair of Ledbetter touchdown passes and DeAndre Washington had more than 100 yards receiving for Wellington. After being a consistent contender in the early 2000s, Wellington had missed the playoffs in each of the past six seasons. There will be a new champion in 4A, Division II as the Kingman Eagles rushed for nearly 450 yards in taking down the No. 3 Pratt Greenbacks, 39-25. The Eagles earn the district runner-up and the final playoff spot out of District 8, which has produced the past two state champions. Kingman led 14-12 at halftime and 24-18 after three quarters on Friday night. The Greenbacks finally recaptured a 25-24 lead on a Landon Studer touchdown pass with 8:45 remaining in the game. But this was Kingman’s night, and more specifically Will Milford’s night. The senior answered Pratt’s score with an 18-yard run to put the Eagles up 32-25 with 3:33 remaining in the game. The Eagle defense then came up big as Logan Waldschmidt intercepted Studer with 1:18 left to give Kingman the ball back. Milford then sealed the game with a 68-yard sprint for a 39-25 lead with under a minute to go. Milford finished with 286 rushing yards and four touchdowns on 15 carries. He entered Friday with 453 yards and four touchdowns on the season. Devin Williams contributed 134 yards and a score as the Eagles ground-out 445 rushing yards. After a 7-0 start to the season, Pratt dropped its final two district games to Holcomb and Kingman. Frontenac completed an unbeaten run through Distict 3 with a 47-22 victory at Baxter Springs. The Raiders jumped out to a 14-0 lead on touchdown runs by Peyton Brown and Kooper Loy. Baxter Springs then pulled to within 14-7 and after an interception tied the game at 14. The Lions then tried to catch the Raiders off guard with an onside kick, but Frontenac recovered. Jake Wilbert then broke free for a 59-yard touchdown run two plays later to put the Raiders in front, 21-14. Frontenac would add a score on a touchdown pass from Brown to Wilbert to lead 28-14 at halftime. Wilbert would add a third score in the second half as the Raiders built a 47-14 lead. This one will be remembered for a long time! Olpe won the District 3 championship in thrilling fashion, upsetting No. 2 Lyndon 41-33 in five overtimes. Yes, you read that right – five overtimes. The game ended when Olpe’s Kadon Redeker knocked down Lyndon’s final fourth-down pass in the end zone to secure the win. Olpe led Lyndon 12-6 at halftime, but a long touchdown pass to freshman Ethan Edington gave the Tigers a 13-12 advantage. Jaden Hielscher then put Lyndon up 20-12 on a 15-yard run with 3:23 remaining. Olpe responded as Colbren Hoelting hit his brother Camden Hoelting on a 25-yard touchdown pass to pull the Eagles within 20-18. Colbren Hoelting then hit Damon Schmidt on the two-point conversion to tie the game at 20. The Hoelting brothers are the nephews of Lyndon coach Brent Hoelting. The game would head to overtime tied at 20. Olpe scored first in OT on another Hoelting to Hoelting connection, but Lyndon would respond with a one-play score to tie the game at 27. Lyndon got the ball first in double-OT and went to their all-everything back Dexton Swinehart. Swinehart scored to give the Tigers a 33-27 lead, but the PAT was no good. Olpe scored and lined up for the game-winning PAT-- which fell short. The Eagles got the ball first in the third OT and throught they had score on a fourth-down pass in the end zone. The officials ruled the receiver was out-of-bounds and the pass incomplete. Lyndon, needing any score to win, suffered a tackle-for-loss, then a holding penalty, and had to settle for a long field goal attempt that sailed wide right. Neither team scored in the fourth overtime. Olpe broke up a Tigers fourth-down pass in the end zone. Meanwhile, Lyndon picked off an Olpe pass attempt and sprinted free the other direction, but the play was blown dead as non-returnable. In the fifth overtime, Hoelting hit Garrett Pimple on a touchdown pass and then Blaine Hinrichs on a two-point conversion pass. Lyndon’s last attempt was batted down in the end zone. Olpe has won four straight in the series with three of those victories decided by eight points or less. Lyndon will travel to St. Mary’s Colgan to open the playoffs, while the Eagles will host Yates Center. Olpe defeated Yates Center 61-0 back in Week 6. Centralia won the District 2 title with a 32-14 victory over previously-unbeaten Jackson Heights. The fourth-ranked Panthers led 16-0 after one quarter and 24-8 at halftime. After a scoreless third quarter, Centralia scored again to take a 32-14 lead. Quarterback Trenton Flentie tossed a long touchdown pass to Kamble Haverkamp and added a short touchdown run of his own before leaving with an injury. We are not able to recap all Thursday’s action, but we’ll go over some of the results from the night’s action. For the second consecutive season, Gardner-Edgerton gave Shawnee Mission East all it could handle in a 6A playoff game. But for the second straight year, the Lancers held on to advance, 42-28. Gardner-Edgerton led the Lancers 21-14 at halftime on Thursday night, before East scored three touchdowns in the third quarter to build a two-score lead. The Lancers took their first lead of the game, 28-21, at the 7-minute mark of the third quarter. The Blazers pulled to within 35-28 with 6:34 remaining in the game before East answered right back for the final margin. Last season, the Lancers scored on a Milton Braasch touchdown with :33 seconds remaining and Braasch converted the two-point conversion to allow the Lancers to advance to the quarterfinals, 36-35. Rossville, the three-time defending champion, fell 14-12 to Council Grove on Thursday leaving the Bulldawgs out of the Class 3A playoffs for the first time since 2001. Ultimately, Council Grove got the deciding two-point conversion in the quarter when lineman Jacob Ziegenhirt lined up at quarterback drawing the defense’s attention to a power run. Instead, Ziegenhirt flipped the ball over the line to a wide-open Brodey King for a 14-0 lead. The score proved to be the difference as Rossville added a pair of late touchdowns. The Bulldawgs needed to beat Council Grove by at least 19 points and have St. Marys defeat Mission Valley in order to get in the playoffs. Neither of those things happened as Misison Valley beat the St. Marys Bears, 26-13. Rossville finished the season at 2-7 after posting a 53-2 record over Derick Hammes’ first four seasons as head coach. Garden Plain held off Cheney 18-13 on Thursday night, but it ultimately wasn’t enough to qualify the Owls for the Class 3A playoffs. Chaparral’s 53-19 loss to Conway Springs means the Roadrunners, Garden Plain, and Cheney all finished with 1-2 records in District 10 with Conway Springs running away with the district championship at 3-0. The runner-up and second playoff spot would be decided by district margin points and went to Cheney. The Cardinals’ district margin of minus-5 was better than Garden Plain’s margin of minus-19. In the end, Garden Plain needed to defeat Cheney by at least 12 points on Thursday night, and the Owls had done their part, leading 18-0 until the Cardinals scored a pair of touchdowns in the final five minutes of the game. Nick Dooley led Garden Plain with 134 yards rushing and two scores. Phillipsburg won 56-6 at Russell and clinched Class 3A, District 14. The Panthers led 56-0 at halftime. The Panthers have had back-to-back perfect regular seasons. Before last year, Phillipsburg had not had a perfect regular season since 1962. The Panthers had a 303-81 yardage edge. Russell finished 4-5, its best year since 2010. Norton defeated Thomas More Prep, 57-15, at home to clinch the District 14 runner-up berth behind rival Phillipsburg. The Bluejays have made the playoffs the last five years. Norton is 7-2, while TMP had a significantly improved season to 3-6. The Monarchs have not made the playoffs since 2002. Jace Ruder rushed 12 times for 208 yards and three scores. He completed 7 of 17 passes for 179 yards with a pair of touchdowns. Monarch quarterback David McFarland, the state’s leading passer entering the game, was hurt in the second quarter. Ness City has had a wild season that culminated in a 5-4 record and a second straight Eight-Man, Division I, District 7 runner-up behind Spearville. Last week, the Eagles scored 52 straight points and beat Satanta with a big comeback, 80-50. On Thursday, the Eagles didn’t need as big of a comeback against Leoti-Wichita County. Wichita County led 6-0 with 5 minutes, 7 seconds remaining in the first quarter. Then, Ness City recovered a defensive fumble for a score, and an offensive fumble for a TD. It was part of 38 straight points with a score 45 seconds left in the first half. Ness City eventually won, 60-14. Then, the Eagles qualified for the playoffs when Satanta defeated South Gray, 46-36, on the road. The three teams went 3-2 in districts. Ness City was +34 in points, South Gray stood at +12 and Satanta was +10. The Lancers defeated Kinsley, 46-0, for its fourth straight perfect regular season. Spearville is 44-1 in the regular season the last five years. The Lancers now host St. Francis in the first round in a rematch of a state semifinal game last year. In its second year of transitioning back to eight-man football, the Bulldogs completed a four-win improvement to 6-3 with a 34-32 home win against Logan-Palco. The Trojans went 7-2, 7-2 and 6-3 in the last three years but had no playoff berth. Eight-Man, Division I, District 4 had five teams with winning records with Osborne (8-1), Victoria (7-3), Bennington, Logan-Palco and Solomon (5-4). Central Christian delivered a marquee victory, 74-28, at home against Caldwell to clinch Eight-Man, Division II, District 2. HCC is back in the playoffs for the second straight year after a 20-season absence with some of those as a non-KSHSAA team. The Cougars, the state’s top offense, enjoyed the first perfect regular season in school annals. Central Christian trailed 8-1 Caldwell, 14-0 early before 42 straight points. Quarterback Nate Heneha had seven touchdowns. He has 18 rushing scores this year. The Cougars have averaged 71 points a contest, on pace to break the state mark. Sylvan-Lucas is 8-1 and the runner-up in Eight-Man, Division II, District 5. The Mustangs delivered a 48-0 home victory against rival Wilson. Owen Krueger rushed for 193 yards. He scored the team’s first four touchdowns on runs of 14, 26, 70 and a 25-yard fumble recovery. Sylvan-Lucas quarterback R.J. Haberer was hurt in the contest. The Mustangs will travel to Otis-Bison in the first round. It marks the most wins for the program since Sylvan Unified and Lucas-Luray consolidated before 2010. Sylvan-Lucas has had three straight years of win improvements from 2-6 to 6-3 to 8-1. Otis-Bison clinched Eight-Man, Division II, District 6 with a 58-26 home win against Hodgeman County. Senior Blake Bahr rushed 14 times for 245 yards and three scores to lead the Cougars to more than 500 yards on the ground. Otis-Bison led 22-14 in the final seconds of the first half when the Cougars completed their only pass of the game, a 33-yard score to Daniel Scott. Hodgeman County earned the runner-up spot. The Moscow Wildcats defeated the Rolla Pirates 52-6 on Thursday night to wrap up a 3-1 record in District 8 of Eight-Man, Division II. However, the Wildcats will not advance to the playoffs as the district runner-up to Ingalls. That playoff spot goes to Rolla as Moscow forfeited its Week 5 game against Ingalls after a player was injured in the first quarter. KSHSAA rules clearly state that should a team voluntarily forfeit a district game it also forfeits its eligibility to advance to the state playoffs. So, despite a 46-point loss to Moscow, Rolla is playoff bound with a 2-6 record.